You are here: Home / Skincare / Essential Oil of the Month: Melissa! Essential Oil of the Month: Melissa! 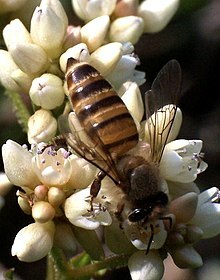 Melissa comes from the Greek word for “honey or honey bee”, other names for Melissa are Melita, Mel, Melina, or Lemon Balm. Melissa was called the ‘elixir of life’ by Avincenna, the ancient Roman physician. The herb was associated particularly with nervous disorders, the heart, and emotions. Melissa was used for anxiety, melancholy, and to strengthen and revive the vital spirit. It has anti-depressant, anti-histaminic, anti-spasmodic, anti-viral, bactericide, carminative, cordial, diaphoretic, emmenogogue, febrifuge, hypertensive, insecticide, nervine, sedative, stomachic, sudorific, tonic, uterine, and vermifuge properties. In skin care it can be used for allergies, insect bites, herpes, shingles, and as an insect repellant. It can help relieve: high blood pressure, asthma, bronchitis, chronic coughs, hay fever, colic, indigestion, nausea, menstrual problems, anxiety, depression, hypertension, insomnia, migraine, nervous tension, panic attacks, shock, vertigo. Essential Oil should not be applied directly to the skin but in carrier oils, putting the oils directly on the skin is too harsh due to their concentrated form. Add a few drops of melissa essential oil to the carrier oil and massage into the face or specific area. Remove excess oil with a toner specific to your skin type or condition with a cotton pad. « Lazy Day Beauty Mistakes! The Bare Minimum Requirements!